Cj loves to decorate the pumpkins with glitter. But I'm worried of the mess, glitter dust. 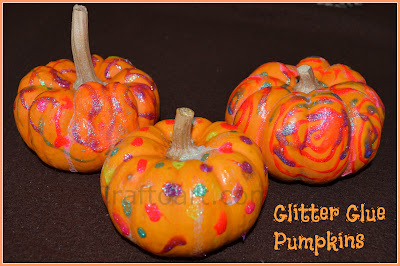 So we used Glitter glue to decorate the pumpkins, not messy and sparkly pumpkins. Thank you Craftprojectideas.com for the glitter glue. I Love how you used the glitter glue! The bright colors look awesome against the orange pumpkins.